Esther wearing her nurse uniform with such pride! Esther graduates! We are really proud and happy for her as her journey has been a real roller coaster ride! Just in a blink of an eye, 3 years have passed and she finally did it. The Esther we once knew when she just finished her SPM and the Esther we know now has matured so much. Through the journey, Esther has not only been studying labouriously (as you know how Nursing studies can be) but she has been class leader, group leader for assignments among other things. Her first semester results started off okay but when the second semester came, we were all very worried. Her results plunged and she even failed one of her papers. She was not allowed to proceed to the third semester unless she passes it. Her school counsellor was also worried and we took turns talking to her about it. She was going through a very difficult time and it was uncharacteristic of her to underperform by this much. With much emotional support and a realigning of focus, she passed the paper and eventually ‘bounced’ back up. She was 10th in class, she improved again with the following semester to 8th and eventually to 7th and then 6th! We have never imposed on her that she must be hitting a certain grade to get our approval. We only kept asking her one thing, that is to give her utmost best - and she did. We want to take this opportunity to especially thank Principal Theresa Arul and Tun Tan Cheng Lock College of Nursing for giving Esther the scholarship and for taking care of her throughout her 3 years. We also thank all our invaluable supporters for believing in her as well. 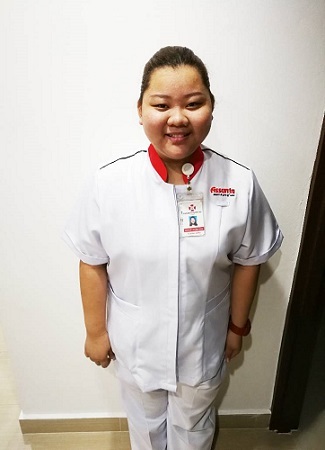 Now Esther has started work at Assunta Hospital in the First Class Medical Surgical Ward. She has to serve and care for VIPs in that ward. She wishes to serve the children at the paediatric ward one day (she really loves children!) and we hope she'll get there soon. Esther has been a blessing and have brought much joy into our lives. We hope that we too have been people that have brought much meaning to her life. She has always cheerful and loves to laugh (pretty loudly) a lot, often filling the room with her good vibes. This is also a bittersweet moment for us, because she is now going to be released from our “nest” but at the same time she will be soaring sky high - We’ll miss you Esther!